I have not read The Quiet War nor Gardens of the Sun, so no doubt I missed some of the A-HA! moments that other readers got. But the promotional copy said this could be read as a stand-alone, and I pretty much agree. McAuley explains pretty much everything – eventually, in some cases – that is clearly a hang-over from the other two novels, and the action certainly seems to stand by itself. I’m not sure whether I am now spoiled for those other two novels, or whether this will simply give me a different way of looking at them. Because I certainly intend to read them, which may be the biggest endorsement I can give of this novel. It makes me want to read more of the same universe. The novel is told from multiple perspectives in multiple places. There’s the Child, growing up in Brazil with what appears to be a fairly normal childhood, but which clearly is not – for a start she is referred to as “the Child,” and capital letters may as well be glowing and red as well as capitals; then there’s the fact that her part of the story is not told by an uninvolved third party or by herself, but by a ‘we’ who refer to the Child as “our dear mother, twice dead” (p4) and about whom too much knowledge has been lost. So, weird. Then there’s Isak, who is introduced while harrowing a hell with Horse, his ‘kholop’ (possibly terminology from the other books? 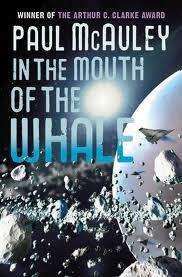 ), and whose life is as esoteric and bizarre as one could hope in an SF novel. Something of an outcast but still devoted to his family and his job, talented, and rather good at getting into trouble and usually getting out of it. Hells are technological rather than spiritual, but there’s still something Dante-esque about them and their connection to the ‘real’ world. Finally there’s Ori, who works “on the skin of the Whale” (p19), whose jobs seem as dangerous as Isak’s but with a lot less kudos. The Whale is a monumental craft orbiting… somewhere… and Ori and her kin are essentially enslaved workers, keeping it going for their masters. She’s got ambition but seemingly little hope of fulfilling it. These three stories look, for a long time, like their intertwining is going to take quite some stretch of the imagination. But intertwine they do, of course, and it works. But aside from the plot, one of the very interesting aspects of this novel is the storytelling techniques used by McAuley. The Child’s story is told, very consciously told: the reader knows there is a narrator, because they break in every so often to comment on what is unknown or on various frustrations. Isak gets to tell his own story – he’s an active narrator, choosing what to tell. And Ori, the slave, is the subject of a faceless narrator, with no choice over what is told or not. Very, very clever. The plot? Well, it’s set a long way in the future, and humanity has splintered into a number of different… I want to say genres, but that would be weird. I’ll go with subsets instead. They do not coexist peacefully, and there’s something that all of them want to control for very different reasons. And in their own way, the Child, Isak, and Ori all end up playing a part in the battle to control and use that object. Each of the threads has some very interesting aspects to it along the way, of course. Through the Child McAuley explores a not-too-distant Earth, with gene modification and other such SFnal aspects but also family interactions and attitudes towards technology. Via Isak the theme of technology is continued, and how knowledge can or should be stored and used – and what it means to keep it safe. And in Ori the ideas of freedom and individuality are played out and explored. Very enjoyable far-future SF, with quirky and fairly well-developed characters. Lots of fun to read.